Well, our week full of Dr. Seuss fun turned into 2 days! We got ICE and SNOW last Sunday and were out Monday-Wednesday. On Friday we had GOOD KINDER FUN! (Like the old days.) After reading Bartholomew And The Oobleck....we made Oobleck!!! So fun! The sounds that came from those sweet mouths when they stuck their hands in were the best! They each got to take some home! We also made Green Eggs and Ham of course. We mixed the yellow eggs with blue food coloring and ate up! Before we ate, we predicted if we would like them or not, then after we ate them we graphed our results. (I forgot the picture of the graph). This response was one of my favorites. She is one of me ESL students. LOVE! 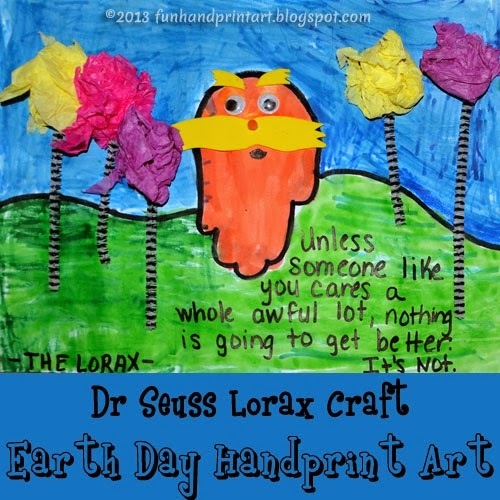 We also made this ADORABLE Lorax picture I found on pinterest! We haven't added our eyes or mustaches yet because it was crazy and we had to wait for them to dry. That was an independent center (except for the handprint). I LOVED the different ways they made their truffula trees! At last, I took their pictures for their scrapbooks. Seriously? SO cute! Okay, I know. You are really just here for the giveaway! One of my colleagues just posted these ADORABLE Sight Word Tri-Folds! I DIE over them!!!! AWESOME right? I cannot wait to use them this week!!!! She has graciously agreed to give one away to one of my readers! Yup! You can win one! It's easy....just enter below! Seuss Week rocked in your class! Looks like you all had tons of fun! Please tell Kim that her trifolds look amazing! I am her newest follower!